A Louis XVI style oval shape mahogany parquetry side table with satinwood and ebony inlay and a mahogany crossbanding border. Having a single drawer and a lower shelf. 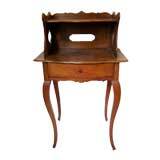 Mahogany Louis XVI work table of rectangular shape with a single drawer and scallop apron on all four sides, standing on cabriole legs with hoof feet. France, late 18th century. Attractive and unusual satinwood Bouillotte table having mahogany cross banding, brass mounts and sabots, France, circa 1950. A pair of charming mahogany side tables with inlaid parquetry design, having a single drawer, a lower shelf, and standing on cabriole legs. France, circa 1900. A French Louis XVI style mahogany table with gallery, drawers and a white marble top. Louis XVI style mahogany side table with marble top brass gallery, 19th century.